Spices and world cuisine are so readily available to us, but even now the prospect of cooking with spices seems to be shrouded in an air of exotic mystery and most people are afraid of using them in their daily cooking. Spices are vegetative substances, such as a fruit, a seed, bark or even skin, that are used in small quantities as food additives to enhance or even hide flavours, for colouring and preserving. These gems also hold many other properties that can be used in medicine, cosmetics, perfumery and as dyes. For example, cloves contain a chemical called eugenol that inhibits the growth of bacteria; curcumin, the active agent in turmeric, not only gives it the beautiful yellow hue Indian food is known for but it also has a multitude of other benefits from antiviral to antibacterial properties. The health benefits of spices are routinely used in various forms of alternative medicine, such as Ayurveda which translates to ‘the complete knowledge for long life’, and is a system of traditional medicine native to India. Indian food is all about having combinations of spices and adding layers of flavour that leaves you yearning for more. It’s not about creating a dish so hot you can’t taste the flavours of the ingredients. Most people tend to be too heavy handed when it comes to spices and seem to add all the same spices to every curry dish they make so everything tastes the same regardless of the other ingredients. Below is a list of the top 7 spices you should have in your cupboard (if you haven't already that is). Coriander seeds are the fruit of the coriander plant, and are round and creamy brown in appearance. The flavour of the spice is completely different to that of the leaf and they should be used in very different ways. The aromatics of the seeds give a warming citrus, almost lemony flavour, which can be amplified by lightly toasting the seed. Other properties of coriander seeds include helping to reduce cholesterol, and boiled coriander water is used as a natural remedy for colds. The herb is really gentle and delicate, and should be added at the end of the cooking process. These are tiny round seeds which can be black, brown or white and are derived from different plants. The black seeds are extremely pungent and as they are difficult to harvest they are fairly expensive. The white seeds are more pungent than the brown ones. Black or brown mustard seeds are widely used in Indian cooking, especially in south Indian and Bengali cooking. They are toasted in hot oil until they pop and release their unique nose-tingling pungency. They work really well with cumin seeds in veggie dishes. You can use them to make various spice blends too. Mustard seeds are high in magnesium, and they are known to help lower blood pressure. The seeds also possess properties which help you digest food more effectively. This red spicy powder is made up by grinding dried chillies. There are many different grades of red chilli powder, from a Kashmiri chilli powder which is mild but gives a vibrant red colouring, right through to a bird’s eye chilli powder which gives a far fierier heat. Capsaicin is the oil in chillies which gives them the heat and intensity they are known for. Different varieties of chillies contain different levels of capsaicin, which is what makes some hotter than others. Red chillies contain high levels of vitamin C which helps the body absorb iron from the ingredients of a meal. Capsaicin is an effective analgesic and has been used medically for pain management. Chilli powder is predominately used both for heat and colour. Usually fresh chilli is used during the cooking process and then additional chilli powder is added if an extra punch of heat is required. My preferred chilli powder is Kashmiri chilli powder or degi mirch, both of which have a mild heat but a wonderful smoky flavour and a delightful bright red colour - perfect for tandoori chicken. Turmeric, also known as haldi, is a member of the ginger family and it looks remarkably similar to fresh root ginger. The root is boiled, dried and ground to make a bright yellowy-orange powder that is used extensively in Indian cooking. It has a bitter taste and a very intense bright colour and should only be used sparingly. It can stain garments, cooking utensils and leave a woody aroma and chalky sensation to dishes if over used. Over the past few years, turmeric has become increasingly popular in the Western world due to various claims of its health benefits. From coffee lattes and tea to food supplements, turmeric can now be found in many different forms. In the Indian culture, it has always been regarded as a super spice due to its numerous health benefits. It's thought that turmeric was introduced into cooking due to its anti-inflammatory and antibacterial properties. Even today, most Indian fish marinades begin with a light coating of turmeric to rid the fish of any bacteria. Turmeric milk is often given to children as a drink to protect the stomach, and it's also commonly made into a paste to treat burns and wounds like an antiseptic. Research has shown that the active ingredient in turmeric, which also gives it its vibrant colour, is called curcumin. It is a natural decongestant which is thought to aid in the treatment of certain allergies and depression, and it is also currently being investigated for its benefits in treating Alzheimer's disease. Cumin, also known as jeera, is the most commonly used spice in Indian cooking. The yellowy-brown oval shaped seeds can be used whole or ground into a powder. Cumin is the dried seed of the herb cuminum cyminum, which is a member of the parsley family. It gives a warm pungent flavour and brings out the natural sweetness of a dish. Toasting cumin seeds whole intensifies their flavour and gives a nutty texture. Cumin is high in iron and has properties which aid the digestion process by stimulating pancreatic enzyme activity. This is an iconic blend of aromatic spices that comes from the north of India and is one of the most important blends from that region. Garam literally translates to ‘warm’, and masala means ‘spice blend’, so it's a mixture of spices that adds and intensifies warmth and refreshes the flavours of any dish. The blend itself is not hot but the combination induces warmth. Garam Masala is added at the end of the cooking process to bring the dish and all the flavours together so it’s aromatic and fragrant. Most families and regions make their own version of garam masala. 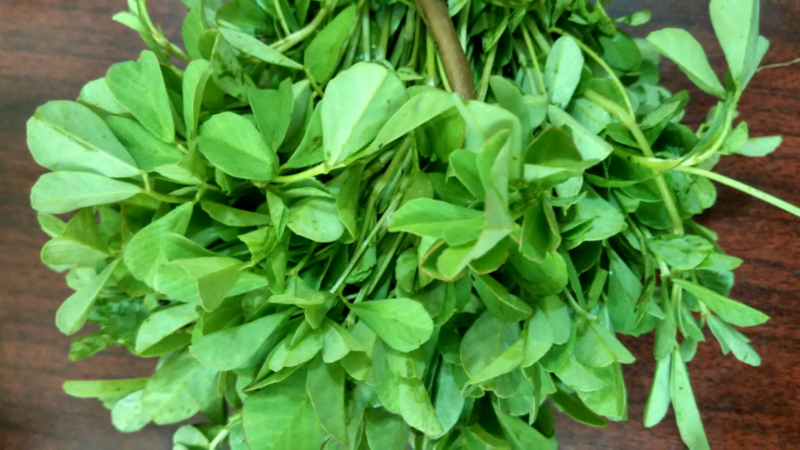 Dried fenugreek leaves have a very characteristic strong musky aroma and a bitter taste. This herb works beautifully when flavouring lamb and lentil dishes, or those with a rich sauce. It is the key spice for butter chicken. The dried herb is used for flavouring and the fresh young leaves are used as greens in a similar way that you'd use spinach. The seed and ground spice are much more pungent so it's not a good idea to substitute the herb for the spice in a recipe. Whole spices are generally tempered or crackled in hot oil at the beginning of the cooking process to release their natural oils before adding the other ingredients. 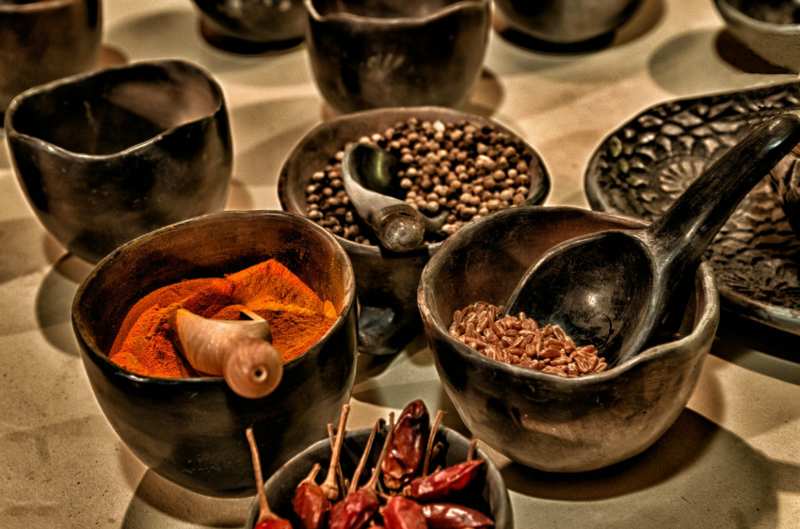 Some examples of whole spices are cinnamon, green cardamom, cloves, cumin, mustard seeds and bay leaves. These spices are added into the pan step by step usually about mid-way through the recipe. They usually come in a powder form so tend to be added to a liquid, i.e. once the tomatoes have gone in. Chilli, coriander and turmeric powders are all taste and colour spices. The more delicate spices are used to enhance flavour profiles and tend to be added towards the end of the cooking process, with examples including fenugreek, cardamom and mace powders. Delicate herbs such as coriander or kasoori methi will go in at the end of the process too. These are a key component of Indian food especially when it comes to marinades and garnishes. Many blends are regional, such as garam masala, panch phoran and chaat masala. Spices come in their natural growing state (these are known as whole spices), or in powder form. If you can buy spices whole and grind them as and when you need them they will retain their natural oils and flavour-enhancing properties for longer. Keep your spices dry, in an airtight container, in the dark and away from a heat source. An Indian spice tin is the best way to keep them fresh. Whole spices are at their best when used within 9-12 months, and ground spices between 6-12 months - so yes, it’s probably time to raid your cupboards and get rid of those tired old spices lurking at the back! This Lamb Chop Curry recipe uses the 7 key spices - click here to try it now. 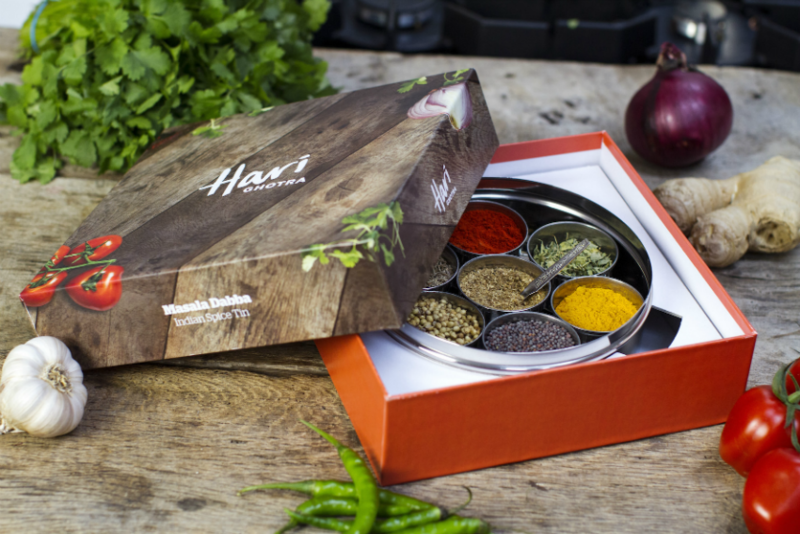 Hari’s always loved Indian food and creating spicy dishes. 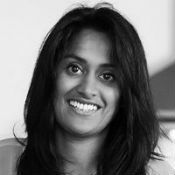 She trained at the Tamarind Collection of Restaurants and flies back and forth to India in search of great flavours, textures and aromas. Subscribe to Hari's YouTube channel here.